"United in blood and bone." I do not hand out five hearts reviews all silly willy nilly. I am stingy with my hearts! But I am not hesitant to give excellent reviews where they are rightfully due. 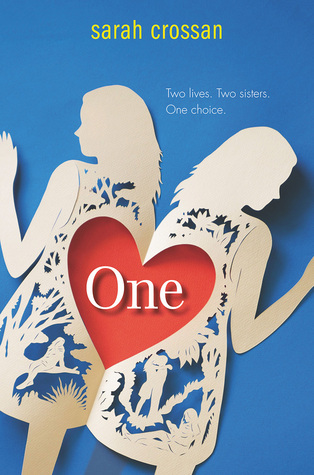 The hardcover novel, One, is deserving. Grace and Tippi are two sisters with two hearts, two lives, four arms but one body. Yes, Grace and Tippi are conjoined twins. They have defied the odds of survival for sixteen years. But time is running out. Something is happening to their joined body and they can't stop it. The girls try to hide the truth and trust each other to make an impossible choice. The author chose beautiful prose to tell the story of Grace and Tippi. I cannot imagine it being told any other style. My only complaint is I wish the story was told in the point of view of both twins instead of one. Wayment...it just hit me that would defeat the purpose of the title. See! I am still thinking of this book. It was simply damn-near-perfectly written.